The Defense Ministry announced in late October that Russia’s new National Defense Command and Control Center (NTsUO or НЦУО) in the old ground troops command building on Frunzenskaya embankment will be fully operational by December 1. It has operated on an “experimental combat duty” basis since April. You can read about the NTsUO here and here. Or you can look at General Staff Chief Valeriy Gerasimov’s description of what it will do. It’s an incredibly expansive list of oversight, monitoring, and decision-support functions for state defense in accord with the Defense Plan. As Gerasimov indicates, the NTsUO will inform Russia’s leadership about what’s happening in the world, the country, and the Armed Forces, and propose alternative courses of action in response to changing situations. The NTsUO will be the apex of the military command and control system. Military includes not just Defense Ministry forces, but also Russia’s numerous militarized ministries and agencies — FSB, FSO, SVR, MVD, MChS, etc. And more besides. But it’s not clear to what extent heavyweights like the FSB and MVD have invested themselves in the NTsUO thus far. Overlooked in the NTsUO is an intent to give supreme commander-in-chief Vladimir Putin better control over his various siloviki in the event of a genuine internal threat to his rule, i.e. coup, “colored revolution,” Bolotnaya march, Maidan, etc. The NTsUO appears to be something Gorbachev, Yeltsin, or even Yanukovych would have envied during their political crises. The NTsUO and its chief may have usurped the role of spokesman for the MOD (which retains its official press-service). 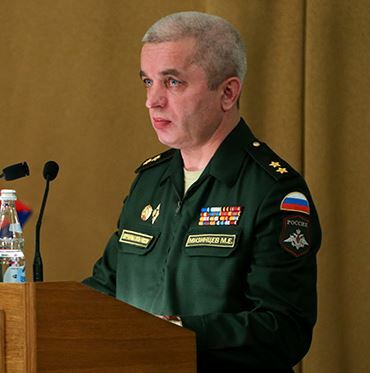 Alongside Defense Minister Shoygu, newly-minted NTsUO chief, General-Lieutenant Mikhail Mizintsev took the lead in briefing the MOD’s Public Council on October 28. His published report was widely replayed by Russian news agencies. So what about the NTsUO chief? Mizintsev is a career staff officer with considerable time spent in tactical reconnaissance. He was born in rural Vologda oblast on September 10, 1962. He graduated from the Suvorov premilitary school in Tver in 1980, and the Kiev combined arms command school in 1984. He commanded reconnaissance or motorized rifle troops up to battalion-level in the GSFG / WGF and Group of Russian Forces in the Transcaucasus. He finished the mid-career Frunze Military Academy in 1996, and served as a “senior officer-operator” [watch officer] in the General Staff’s Main Operations Directorate (GOU) until 2001. He returned to the schoolhouse and graduated from the senior-level General Staff Academy in 2003. Mizintsev served as the chief of an unidentified GOU group through 2007. He then became chief of the operations directorate and deputy chief of staff for the Moscow Military District. He likely came to the attention of Valeriy Gerasimov at this point. Gerasimov commanded the district starting in 2009. From 2010 to 2012, Mizintsev occupied the same post in the North Caucasus / Southern MD. In August 2012, he became chief of the General Staff’s Central Command Post (TsKP or ЦКП) until it disbanded and he took over the NTsUO. Mizintsev’s rise from O-6 was quick; he became a one-star in December 2011, then put on two-star general-lieutenant rank barely two years later.